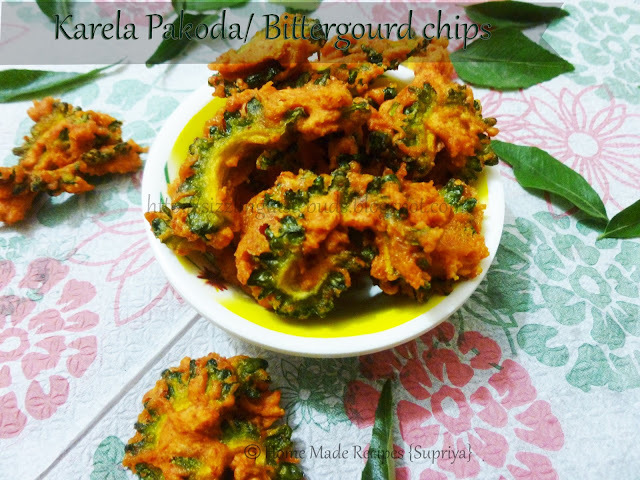 Posting another recipe of this most hated veggie KARELA or BITTER GOURD. A simple Karela Stir fry recipe is already on the blog. Check it out here. Everyone are aware of the nutritional values of this veggie but still avoid it. Try this and I am sure you will change your views for good. Step 2 and Step 3 is to lessen the bitterness of the bitter gourd. You are always welcome to skip these two steps.Deep Frying also reduces the bitterness. 4. Mix all the ingredients along with squeezed bitter gourd (except oil) with little water till the bitter gourd gets coated with the flour. Don't add too much of water. Batter should be thick enough just to coat the veggie. 5. Heat oil in wok and carefully drop these veggie's one by one for deep frying. Fry it till in a medium flame till it gets golden brown and crisp. Note: You can also include the seeds of the bitter melon. Add 1 or 2 tsp of hot oil before mixing it with besan and rice flour. It gives more crispier chips. Love these bitter gourd pakodas.. Delicious!